Most pundits commenting on the probable election tomorrow of Roy Moore as a U.S. Senator from Alabama are focusing on his “sexual misconduct.” His history of “dating” teenagers when he was in his thirties has provoked outrage and soul searching, with NY Times columnist Gail Collins asking whether Republican voters are willing to vote for “an upstanding family man” who could be relied on to support Democratic agendas or “an awful slimeball who you could count on to support all the things you believe in.” A third option? “No fair answering moving to another state,” she writes. Bah-dah-bum. I point to Collins’s piece because I’m actually more concerned, at the moment, with another, less funny “third option.” National political leaders, mostly Republicans, are ducking the “yes/no” question by calling for voters in Alabama to make the decision, themselves. “Popular sovereignty” was the ruinous policy intended to let the will of the people on the ground determine the expansion of slavery before the Civil War. 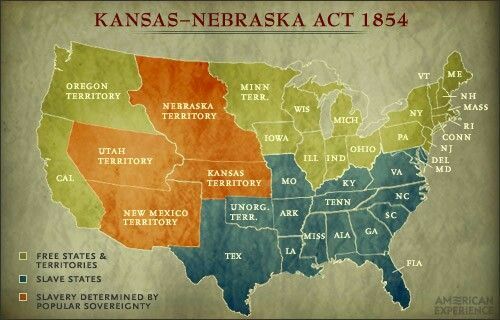 The federal government did not have to make a decision about slavery’s existence in territories such as Kansas and Nebraska. Instead, to mollify Southern slave owners, those elected to federal office decided that residents of the new Western territories would cast votes. If Kansans wanted slavery, they would have slavery. This weasely policy led to claims of voter fraud, with free-soilers claiming the winning pro-slavers had brought in non-residents to cast ballots. Free-soilers established a separate legislature and refused to recognize the legitimacy of the election. Pres. Franklin Pierce sent federal troops to Kansas to quell violence, which got so bad that the rest of the nation came to refer to the territory as “Bleeding Kansas.” A second ballot re-established a pro-slave majority. It was not until 1861, about three months before the nascent Confederate army fired shots on Ft. Sumter in South Carolina, that popular sovereignty made slavery illegal in Kansas. At that point, the federal government brought Kansas into the Union as a state (rather than a territory), signaling an end to the expansion of slavery and an imposition of federal will on the American South. How many more compromises will we make in 2017 to avoid having to condemn discriminatory behaviors? When will Republicans realize that by refusing to confront the likes of Roy Moore and Donald J. Trump, their conciliation may, in the end, lead to the nation’s undoing? If the Union could come asunder in 1861 after a series of unholy, unjust compromises, is it beyond the possible that it could split apart once again in the twenty-first century? Last: many have criticized Pres. Barack Obama for his unwillingness to bring those with irreconcilable views to the bargaining table. They point to Pres. Lyndon Johnson as an example of an effective dealmaker. While I have some sympathy for these views and even, as a longtime Texan-in-Exile, appreciation for LBJ, I also think there are times when it’s not possible or even effective to compromise. Politics, it is said, is the art of the possible. What art will it take to make it possible for Republicans to refuse to be governed by lying, cheating monsters?